The Cyclo PRO Wolfgang Kit features the variable speed model 5-Pro polisher! Wolfgang polishes feature Menzerna abrasive technology. Give your vehicle a makeover with the Cyclo PRO Wolfgang Kit. This kit includes professional grade Wolfgang polishes plus the heavy duty Cyclo Orbital Polisher. 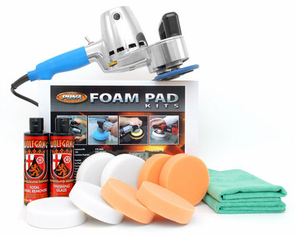 This kit is perfect for scratch and scratch removal and shine enhancement. The variable speed Cyclo lets you perform high speed paint correction or slow polishing. The Vibration Elimination System (VES�) is available exclusively on Cyclo Dual Head Orbital Polishers. This system is composed of a completely redesigned counterweight and precision matched, weighted inserts, which nearly eliminate the amount of vibration felt by the operator. This drastic reduction in vibration lessens muscle and joint fatigue for the operator. The counterweights are pre-installed on the Cyclo and yellow, silver, and blue weighted inserts are included. Cyclo ProGuard Backing Plates are included. Wolfgang Total Swirl Remover 3.0 is a hybrid of our original Total Swirl Remover formula and Menzerna�s fast-cutting polish for ceramic clear coats. It combines Wolfgang�s diminishing abrasive technology with Menzerna�s special milling process, which produces consistently sized, fast cutting abrasives. Wolfgang Total Swirl Remover 3.0 is an aggressive swirl remover with the gentle touch of a shine-enhancing polish. It�s not an oxymoron � it�s a unique breed of abrasives that level paint without scratching. Wolfgang Total Swirl Remover 3.0 starts improving the paint immediately and leaves the paint noticeably smoother and shinier, even before the finishing polish is applied. Constructed of the finest quality microfiber, the Cobra Detailing Towel sets the standard with an outstanding 80/20 blend of polyester/polyamide filament, woven so densely they boast over 200,000 strands of fiber per square inch of fabric! These strands are nearly invisible to the naked eye, and are 100 times smaller than a human hair! Use this cloth for cleaning, buffing, and wiping away wax. A total retail value of $469.94. Save $44.94!